New interviews: Shannon Shanks of Broken Pattern (etsy); Phil Powell of Custom Wood Designs (etsy) and Ian Tait of IST Crafts (http://thewoodemporium.co.uk) have all agreed to mini-interviews — all are very busy, but I’m excited to share work by each!!! 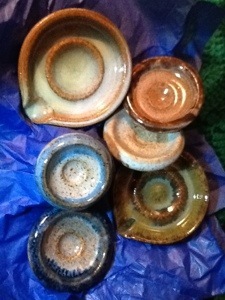 And new items and designs in 2 shops (more info below); and my thoughts on bowls. Shannon takes a very organic approach to wood-turning and my spindle-collaboration reminded me very much of the process used by artists and artisans I’ve known throughout my life. Broken Pattern contains a range of different fiber arts tools as well as a variety of hand-dyed and hand-spun fibers. He makes beautiful drops and recently developed a design for metal tipped Russians — and they are FAST!!! I’ve since experimented plying Deb’s fiber — traditional 2-ply and my first N-ply (Navajo or 3-ply) spun/plied on the Hansen. **NOTE: Metal points have the potential to ruin wood bowls, esp. softer woods. 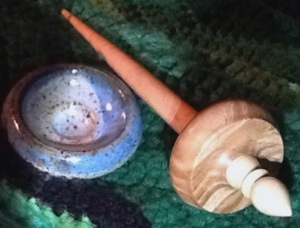 I only store fauxlogs and small nests of fiber of projects I spin from bed — I'd never risk using this for spinning! 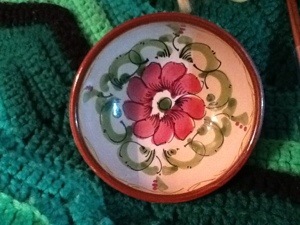 Sycamore bowls w/a trim to match the wood of the Tibetan are also available. So, I rarely make shop updates listed on Ravelry — even if I do, most items fly off virtual shelves too fast; if a 30 second window exists…well, most spindles are too long or heavy for me to just outright purchase. Yet, I still look at recently sold items and try to keep up on different trends and styles. First, I must say Enid Ashcroft seems especially inspired in her work over the past few months. I admire her as an artist and person; and certain designs of late…well, the wood, the attention to detail, the courage (Paduak Russians with sap wood! How is that possible?! ), new designs — beehives in almost every style, and, although not a new item, Enid has included drop spindles (made in the Blossom and Pagoda styles that give her other spindles a unique artsy flair and, most recent to appear, a beehive drop) in her shop almost every week. And, last but not least, Joshua Lynch of TexasJeans (etsy) has added 2 new spindles to his line-up: Tibetan and Victorian Lace Spindles!! His Tibetans are made with the same thin flick many of us enjoy using, with attention to speed, balance and longevity — and they spin impressively long! Shafts are maple, curly maple, walnut and cherry, with 2 styles of whorls in a variety of wood choices. Stay tuned for these and other updates coming soon to a blog near you! Feel free to leave a (kind) reply below.